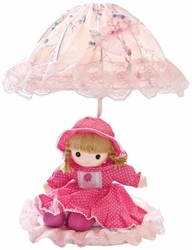 Your child will love this soft pink baby doll accent lamp! An adorable baby doll is bedecked in a pretty pink dress with fancy lace in this decorative children's accent lamp. The removable dolly rests on a round cushion of fluffy pink fabric with ruffles that matches the round umbrella shade with ruffles. • Pink baby doll accent lamp. • Pink fabric, lace and ruffles. • Maximum 40 watt bulb (not included).